I obtained this from Glasshouse Works in May, 1997. Although it arrived as one broken leaf and a root, it's become quite well established and since this photo has begun to sprout a new and larger leaf. I'll upload the image of the new leaf when it opens. 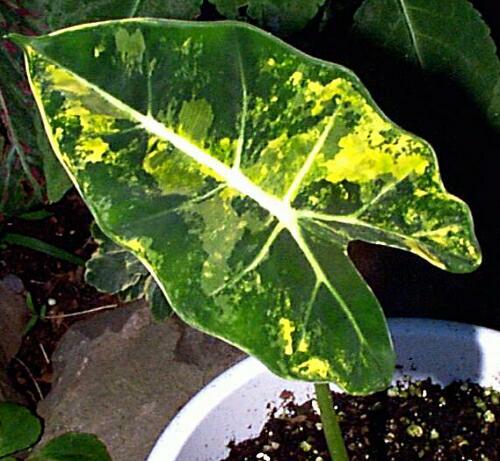 It's my understanding that there is a white variety of this plant and that this golden variegation is more difficult to obtain. Be that as it may, I'm not sure which I'd prefer if I had my choice. I hope to swap an offset for a white variegated variety. No one has indicated that this is a cross. If that's the case, then it needs a species name. On the other hand, if the wild occurring plant is difficult to raise and someone named "Frydek" identified a variety that's easier to grow, then I'm willing to give Mr., Mrs., or Dr. Frydek the due credit. May 1998 - I've learned that temperature has some apparent effect on the degree of variegation. Towards the end of the 1997 growing season, I had left the plant outside perhaps a bit longer than I should have. (No, for a change it didn't quite get frosty out.) The leaves were barely variegated at all. I feared that the plant was reverting. I had heard from some aroiders that occassionally, variegated plants become solid green. Over the winter, the plant survived and grew on a kitchen counter top. All the leaves over the winter have had this same kind of mottled appearance. As the leaf gets older, the yellow fades to a cream color.